In card games, a bet required, to begin a hand. The entire set of optimal plays for any given blackjack hand as determined by computer simulation. Varies slightly under different rule conditions and different numbers of decks. Must be memorized before advancing to card counting. The dealer in the baccarat game. A French word. Also known as Caller, or Dealer. Also Euro. A single European currency that officially replaced the national currencies of the member EU countries. A player's risk and win are the same. Ex: Wagering $1 to win $1. In slot games, it allows for continuous play through the "Auto Play" button. Any player can explore it, even beginners. At online casins, the instant no-download version of the software. In poker games where five community cards are dealt. The first three of these cards, called the flop, are dealt face up, all at once. The casino and its games. Multi-reel, multi-line slot games with animated video clips, interactive bonus rounds and storylines that unfold over the course of the game. A player's skill controls the outcome of each round. Online casinos that use Rival Gaming software offer I-Slot games. In blackjack, a bet that can be made when a dealer shows an ace as an upcard. This bet wins if the dealer has a blackjack. A jurisdiction that licenses and regulates interactive gaming, including casino, poker and sportsbook. A wager on the winner of a game or event, without any point spread odds. The gambler who wins is paid back the set percentage of initial bet. Example: A $100 bet on the (favored) Green Bay Packers to win pays out $70. The lines, straight or zigzag in alignment, on a slot machine that the symbols from each reel must line up with to win money. The amount of money a player is given as a result of a win from a casino game. Slot machines that increase in jackpot value a small amount for every game played accross its network. Random Number Generator - a computational device that generates a sequence of numbers or symbols that lack any pattern. Bottom of this page can show how an RNG works. A square puzzle forming an overall grid of 81 boxes. To solve it, every row, column and smaller 3x3 box must contain all numbers 1 through 9. 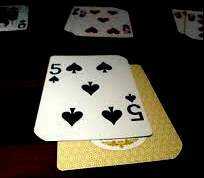 In blackjack, an option that allows a player to give up half of the bet placed. The player turns in his cards and the hand is finished. In blackjack, the dealer's card that is face-up for all players to see before playing hands. Electronic slot machines that are run by computer software. All online slots qualify as being video slots. Very Important Player: One who is worthy of full complimentary treatment. A secure software tool for managing a player's online banking transactions.